Graceful on the wing and a quintessential sight when visiting the seashore, seagulls tend to fascinate us with their acrobatic antics and noisy squabbles. While the birds' noisy squawks and flapping at first may appear chaotic to the human eye, they're part of a complex communication system designed to keep order among birds. Two dozen species of seagulls flourish in North America, with calls varying from species to species. One of the most studied is the Herring gull (Larus argentatus), which exhibits a wide range of discernible calls. By contrast, the Glaucous gull, who lives in the Arctic, is credited with a mere two calls. 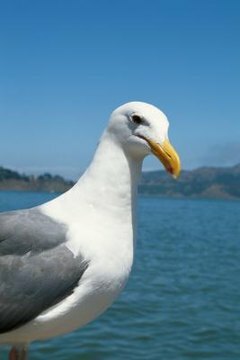 All species of gulls belong to the genus Larus and exhibit some characteristics of communication in common. Even before chicks hatch from the egg, they make a peep that sounds like "klee-ew." The call attracts the attention of their parents, inciting them to provide the hatchlings with regurgitated food, which is crucial to the chick's existence. Parents can be heard "baby-talking" to their chicks in soft vocalizations of this same call, and may use it during courtship as well. Both parents take turns sitting on the nest and caring for the young birds. When a female is ready to mate, she'll make a huoh-houh-houh call while using submissive body language in front of a male bird. The male will assume a dominant upright stance, arch his neck and vocalize with similar sounds, as well as in long mewing sounds. The single-note mewing call also is used by both sexes to attract attention in a variety of situations, such as approaching the nest, feeding the chicks or in a display of aggression. Assertive body language is used to defend the nest or food item, and usually involves a lowered head and strong heaving motions of the body accompanied by growling vocalizations. Other defensive body language includes standing tall and batting intruders with the wings while screaming loudly, or chasing the interloper on land or in the air. The chicks of some species use body language by pecking the bill of the parent bird to incite them to regurgitate food for them to eat.